As a military brat who went to fourteen different schools before starting high school, scouting provided one of the few consistencies for my own life. Unlike today where thanks to so many moving with the military, my Boy Scout experience was a confused mess where each new scout leader, assistant leader, and merit badge counselor required me to repeat all time and time again. My parents used to tease me about my holding the world record for having the most merit badge counselors on some of my badges. Three of mine took nine different merit badge counselors giving partial signoffs. Regardless, I still managed to survive Cub Scouts, Boy Scouts, and Explorer Scouting helping to pioneer one of the first Explorer Air Scouting units in the country. I have to admit getting far too excited about the flying to go back and redo the few badges just one more time to finally earn my Eagle Scouting rank. Now with the benefit of over forty years hindsight, that is a mistake I still regret to this day. Regardless, as many who know me will gladly attest, I never really grew up, just got neater toys and am still associated with scouting today. Like most a few generations back and unlike most today, I started my family after getting my professional career going. Although my children wish I was younger and had more energy to play, the advantages of being well established are considerable. We were able to carefully choose exactly what neighborhood we wanted with the right school district, etc. We settled without moving repeatedly giving our children the stability I missed while growing up. My worldwide upbringing certainly opened many horizons, but left me severely lacking in many relationship and interpersonal skills because I always knew that in a few months I would be moving on. Having grown up in woodworking and construction, before even getting out of the Boy Scouts I was drafted to help rebuild our old Scout Cabins, local church, and community centers. We are not talking planters, but instead putting up new buildings, foundations, plumbing, wiring, installing sheetrock, floors, the whole works. 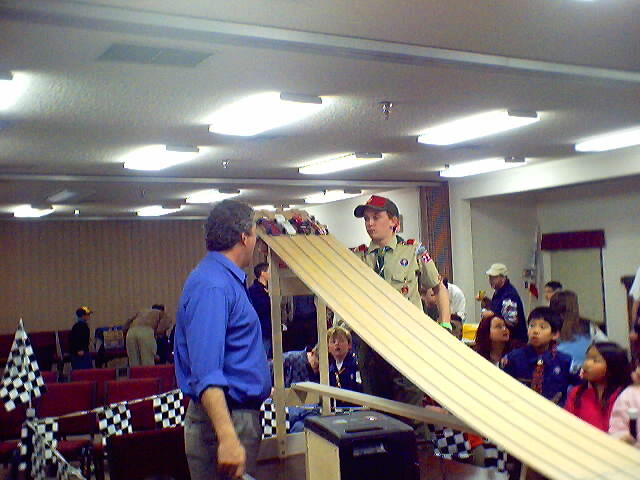 Knowing I enjoyed woodworking and was always willing to help with scouting projects, after a little needed grumbling, my long time scout master friend in Davis California drafted me to rebuild the old pinewood derby track that my little brother used as a Cub Scout. My brother helped continue a long standing family tradition of working closely together to teach woodworking skills and built something that not only worked, but worked really well consistently winning awards for design and speed. The original track used in our district had two lanes and was made long before there were any official scout standards except setting the track height, overall length, and width of the lane center steering boards. We contacted Scouting headquarters getting an "official" plan for just how the track had to look. I bought some plywood and went to work. The result allowed racing four cars at the same time, had a pull down starting gate made of heavy wire fingers, and all came apart so it could be stored in someone's garage for the nine months out of the year it was not used. I was happy with the results and suspect that late sixties vintage track is still around somewhere in use. In the middle seventies, I got a strange call out of the blue from a new scout master who told me I was going to build him a new pinewood derby track for his newly forming Pony Express District in Fair Oaks, roughly twenty five miles away from my home in Davis California. It seems he did some checking and most of the area was still borrowing the same track and spacing out their contests so all had a chance to share that one track. Unfortunately, someone remembered that I had built that track and the district needed another. As always I did my gruff grumbling and whining, then finally agreed to make a new track. At the time my job was designing digital equipment, so of course the new track ended up with four built in timers that gave the finish times to the nearest ten thousandth of a second. I could have provided far more accuracy, but the cheap readouts I found only had thee digit accuracy. As with most of my projects it seems I spend as much time figuring out how to make them better as actually building, then continue thinking of improvements for years after each project. In the case of this track, I came up with a much better starting gate, an area that slowed the cars safely without crashing into a pillow, and a much easier way to setup and hold the track together. All went together in minutes with a single Allen wrench. Anyhow, all of those improvements ended up going into that track and it vanished from my world hopefully never to be seen again. I admit liking to help scouting, but invariably found that all the promised help, materials, and financial support inevitably ended up either never happening or often taking me more time and trouble than having no help. That track was a huge amount of work, cost quite a few dollars in both wood and electronic parts, and I never so much as got a single thank you after the initial thanks for delivery that required me borrowing a friend and his pickup. Another few years went by and I never heard another word about pinewood derby tracks, then in the early eighties suddenly got letters from a few scoutmasters spread across the country. When I gave my track to the district it included a full set of detailed plans, parts list, and building instructions with helpful hints. Without my ever learning otherwise, apparently both my design and timer got forwarded on and became the Scouting standard. Meanwhile the widespread use of PCs ended up with a fellow taking the output from the timer I designed and hooking it into the serial port on a personal computer. He was a pretty knowledgeable hobbyist, but when he was asked to share his design for others to use, he instead said his design was just not reliable and he had to sit and tweak it every time it was used. He told them it took a lot of work but he finally found out that I designed the original timer and track. Somewhat known in the computer field for having helped design quite a bit of the early PC hardware, he recommended that I be asked to develop both a PC interface and computer program to help manage pinewood derby contests. Having promoted out of that field into management long before, I immediately said a firm no. I cited the normal excuses. My skills were too dated. I did not have the computer programming skills. I did not have the time. Of course the head people in scouting are picked for their skills at motivating others, so I again ended up not only agreeing to build a computer based timing circuit and software, but also another new prototype track for our local district. Although slow, I do learn and managed to draft a couple of employees and a current electrical engineering professor friend, all with active Cub Scout children. We pretty much duplicated the prior track, adding a few clever and better supports, used the same starting gate, and provided the timer, computer interface, and a rough program that worked using Lotus 1-2-3. All was happy until about the time my own son became a Cub Scout. It seems our district still had exactly one pinewood derby track and a whole bunch of new packs were making access to that track a scheduling nightmare. I discovered Scouting is a small world and in spite of thinking I was well hidden, another request came my way to help the district. I again said no, got talked into saying yes, drafted some help, and made an even better track yet. This time I used some really nice Baltic birch plywood and a stash of some hard rock maple left over from another project. Again my detailed plans, parts lists, and building instructions were shared with the delivered table. Also included was the update to change the interface to Microsoft Excel from the dated Lotus 1-2-3 spreadsheet program. Strangely, after twenty years of making these tracks, my own son never got to use it until he won the local races and moved on to the district. During the district races I was surprised with a nice award for having helped with these tracks for so many years. Immediately after I was volunteered to serve as a track and race judge for the meet. So if you want to build a track from scratch, please go Boy Scouts of America direct and get the latest version of the track and timer specifications, or buy a completed track from them or a recommended vendor. They have continued to make changes since I built my last in 1985, so I am sure my specifications are not current. At the same time, I can guarantee having some early influence on most of what you will get. Track Accessories can make a big difference in how well the contest will go. I made a couple of open sizing boxes that were right at the limits for the length and width of each car. Our den mothers checked each car by putting the car into the box then setting it on a digital postal scale. For boys whose cars were too light we had some adhesive backed lead tape and would give them just enough to be right at the desired weight. For those with too heavy of a car or cars greatly in need of a little help to make them roll we setup a little work area where the Boy Scouts and a few volunteer dads had their portable drills, graphite, spare wheels, spare axles, superglue, and even a little quick setting epoxy. Two of the most disappointing things that can happen during these events is to have someone drop your car or fail to run your car in the race. To help avoid these problems I made 15 shallow organizing/transport wooden boxes with side handles that stored four cars. The boxes were shallow enough that people could see when their car was going to race. In addition to keeping all in order, these boxes protected the cars from being dropped by over eager scouts and fathers. When making my first pinewood derby car, My father pretty much let me go on my own. We then worked together with him doing much of the work to build a second car, and finally we worked closely together to build the third. He started making model cars, trains and planes very young and went on to win many competitions when he was young. He apprenticed under a stern woodworker to earn journey then master certificates in fine woodworking. His woodworking mentor was "old world" school where quality, sharpness, and efficiency were everything. Fortunately, my father proved far more patient and sent me to classes then worked with me when I wanted helps and tips. As headstrong as I tend to be, I suspect he had no other choice. Our first car was the one we entered. Unlike all of the strange looking machines, it was a near perfect model of an old Cord coupe, identical to one my father had as a young man. It looked great and generated lots of attention including many negative comments that hurt lots. The rules were clear this was supposed to be a combined father and son project, yet most felt that my father had done it all. I resented that considerably because my own plane models were already earning awards in various Air Force base modeling competitions and I worked really long and hard building up those skills. Regardless, from all that I learned many lessons and that was the object of the whole exercise. 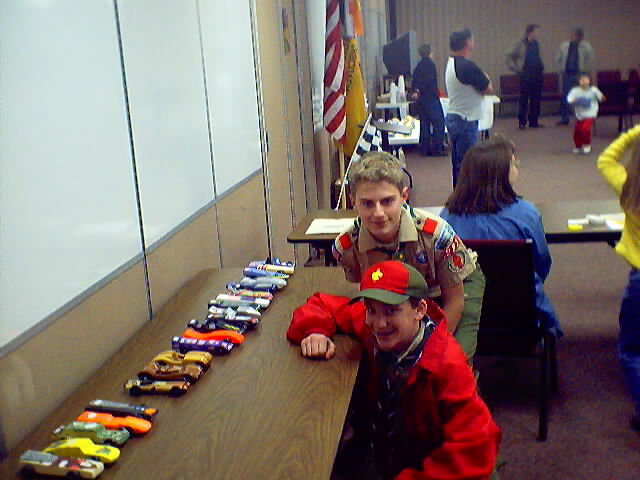 My next involvement was with my little brother and his pinewood derby car. My brother had far less patience and was mostly best at just beating on things until they either broke or he got tired. Sadly, my father had very little patience for this approach. Perhaps the two were way too much alike. Regardless, my brother came to me for help handing me his first best try and it was worse than bad. Now before you get the wrong idea, this is the same little brother that was doing so poorly in school he was tested for special education and found to be one of the brightest kids ever tested. He was just bored out of his mind and kind of stayed that way until he discovered sports. I had to buy him another pinewood derby kit. We went to work drawing on the block the basic form of a fifties style stock-car with rounded pointed bullet nose and tail. Wheels sat on the end of struts that came out of the car bottom perpendicular to its centerline. I'll never forget how he demanded that we paint it what was then known as Ford Thunderbird metallic blue, a nice pretty blue-green dark turquoise like color. It did very well both in speed and design. Some twenty five years later I got to help again, this time with my son's pinewood derby cars. His leftmost car in the picture was my son's first with the help of lots of jigs and about three wooden bodies that just did not make it! We re-sawed his pine block into four equal sized pieces with help of my band saw. He glued up a piece of red oak scrap to the two center pieces to make a racing stripe and cut out the center himself on my scroll saw to create a body with an oak racing stripe. He glued some scrap rosewood to each of the remaining pieces, used double sided tape to stick them together and cut them to make the fenders on my scroll saw. Using my pneumatic and PC block sanders he sanded both the center section and the sides, then glued all together. The steering wheel has broken off, but the car ended up not only as fastest but also got an award for best looking. It went on to win best looking in the District cup too. We think it would have done well in the speed run. Unfortunately, the district scoutmaster dropped it breaking off the front corner and wheel. They did not allow on-site patches, so with only three wheels it flopped on the speed run. His second year he did the same thing using mahogany with inlaid racing stripes of hard rock maple and cocobolo, plus on the top of the car he made (after about 30 tries on my scroll saw) a cocobolo scout emblem. That car also won a first place for speed and first for looks, but district only allowed one trophy per car. My son chose to keep the one for best looking. The rightmost car was his third and final year entry. By then he had pretty much mastered "his" scroll saw. Nobody warned me this might happen! My tools are now our tools where I need to all but get permission from my son and daughter to have time to use them myself! That car is also made with laminations, but this time he cut out and inlaid into walnut head and tail lights plus made a plastic racing canopy then covered the car in Tasmanian Devil and Yosemite Sam stickers. It also won both looks and speed for the troop and came in second for the district in speed. Not bad considering there were over 800 cars competing. As one of the long time judges I began in our troop and it quickly spread to also have a Dad's only competition both for looks and speed. Mine for year after year placed first in looks and second in speed. My engineer friend at work is just unbeatable! There are lots and lots of myths and "experts", most of who sound pretty knowledgeable when it comes to making either a nice or very fast pinewood derby car for Cub Scouts. To add my two cents to the pile, I did build most of the track used in our area as well as the digital timers, PC interfaces, and digital counters. And in the adult only division they just moan if I bring a car to any of the pack, sectional, or district races. Axles: Buy a bunch of kits. For our divisional winning fastest car, it took us five kits to find four axles and wheels that rolled really well. To prepare the axles take off the burrs on the axel nail shaft, bottom of the nail head. The easiest way to do this is to use a power drill. Put the pointed end of each nail in a good drill chuck making sure the portion where the wheel will rub is not touched by the chuck. Start with a file on the back side of the nail head to take off the tiny burrs made with making the nail, but be careful to not touch the nail shaft. Next, make the nail shaft meaning axle round and clean of any burrs or manufacturing defects by spinning it in the drill working it over with a jeweler's file, then 1500 grit wet/dry emery paper followed by auto polishing compound. This takes a light touch or you will get an out of round nail. I also lightly tapered the back of the nail head so only the center portion actually rubs against the wheel. After doing this pick whichever wheel seems to spin the longest then test every axle spinning that wheel timing with a stop watch until you have the four best axles. Wheels: Use a sharp Xacto knife to carefully reduce the plastic seam mold lines from the wheels followed by light sanding and polishing to make the wheel center smooth. Then lightly burnish the inside of each wheel bushing with one of your good graphite covered polished axle nails. After preparing at least sixteen to twenty wheels, spin each on the same axel using a stop watch to time the length of spin. About one in 4 or 5 will just go on and on with all the rest wobbling and coming to rest much quicker. Apparently the very slight material and manufacturing differences make a huge difference in wheel performance. Axle alignment is critical and any toe in, toe out, camber or caster will make the car squirrelly killing its tracking and speed. A machinist square and my drill press inserted the axles dead on square to the body. Some epoxy holds them in place lock square. One of my engineer friends disagrees with this approach and tilts each axel slightly upward so the wheel rides on the inner edge of the tire and it only rubs on the inside of the nail head rather than touching the body. My cars consistently have beat his, but I don't know if this is from my picking better wheels and better axel prep or if his approach causes the car to track more poorly so more often bangs into the center track rail. Either flare the body or use an axle so only the hub portion of the wheel can rub against a minimum amount of car. The body underside needs to sit as tall as it can and be flat except for slightly upward curved at both the front and back. Otherwise, it can hit or drag on the center rail that keeps the car tracking. Staying with a flat front is also very important to avoid getting hung up on the starting hooks or block. The weight goes as far back as possible to maximize the potential energy. Although others ignore wind resistance, I make mine look like they should get a speeding ticket when parked including a number of hand rubbed-out coats and a good wax. The body needs to be made low and flat for minimum wind resistance. There are some pretty spectacular lubricants that could be used on one of these cars, but in most cases The rules are clear that only graphite may be used. The best lubricant I found is Sandaro Bearing Lube that let a fellow and his son win a number of races. It contains Teflon and gets more and more slippery as the car runs. They were discovered in the divisional race after winning their local and area races. They were disqualified for that race and all prior races, plus ordered to apologize and return their prior trophies. Graphite will only last a certain number of runs, roughly four. Too much slows the car on the first run, so we loaded our up well then did the equivalent of one test run just before the official competition. Those that use it often do much worse. When you don't get to tweak or re-lube between runs, then no test run and hope the graphite will last for all the competition runs. Finally, use a digital postal scale to get right on, weight, wheels and good tracking are all in this competition! Attached are some pictures of what we did. And my ultimate secret is being the judge *wink*. Although it would be nice to claim brilliance on these, they were a simple box taken from some inexpensive boxes our Den Mother found. To make them I started with a standard 8' long Douglas fir 1"x4" one inch thick. One half inch from the sides I cut a 1/8" deep groove on each side the length of the board by just running them across my table saw. . The top groove holds a piece of 1/8" thick tempered safety glass and the bottom a piece of 1/8" thick Masonite. I then used my chop saw to cut mitered corners to make two longer top pieces and two side pieces. I then ripped the top off each of the boards to make the lid. With a square corner clamp I glued and used my pinner to assemble the top and bottom, with glass in the top and Masonite in the bottom. Be careful with the pinner because it the nail hits the glass, the glass breaks. I learned this the hard way. I then let the boys stain their own boxes using a dark gel stain with lots of gloves, shop aprons, etc. and still got stain all over. Finishing the box required two small hinges in the back screwed into predrilled holes, plus a nice latch in the front also screwed into predrilled holes. One of the more fun projects that I did with the Cub Scouts was help them to all build stilts. Unlike stilts that have a foot band that can be dangerous these simple stilts are worked by holding onto the stilt and pulling up to your shoe. Each set of stilts starts with a 10' long 2" x 2". We found these already cut with rounded corner edges. We measured then cut them in half with a hand saw making two four feet long boards. I then had the boys drill the holes using drill jigs I made. I premade the foot rests wedge shaped pieces by cutting a 2" x 6" and the boys drilled the foot rest holes using another jig and my drill press. They then sanded then bolted all together. These were such a hit that after making the stilts for my son's den, I ended up helping to make these units for the rest of the pack. That upset our Girl Scouts, so also had to make stilts for our Girl Scouts. Interestingly, some garage clean out left me with too many extra pairs of stilts, so the extras went to our local grade school community rummage sale fund raiser. While there I saw at least four other couples selling identical stilts. Those selling their stilts and many who stopped by shared wonderful stories. The ones we had for sale went quickly as gifts for grandchildren.